If you go to the Apple website you can check that the iPhone 6s is still on sale. It is a 2015 device that has full force and is now going to be launched in India . Interestingly, with the same strategy that was used with the iPhone SE and a very clear objective: exclusively the Indian market. It will be again in the city of Bangalore, where the Wistrom company will dedicate part of its effort in manufacturing the iPhone 6s , but it will only be done for that market. Many will ask you the reasons for not importing them directly from the factories of China and that they are the ones that supply the rest of the world. India applies a 20 percent tax for the importation of technological products. It is something that makes sense in one of the countries that is one of the emerging economies of the planet , with a current population of more than 1,300 million people. With this exclusive production the benefit is double, everything remains in the country and a device of recognized prestige is obtained at a significantly lower price . India, being an economy in the process of expansion, access to technology may not be as varied or easy as in many Western countries. It is already known that Apple always bets on a winning horse and if the move was already round with the production for that iPhone SE market, it will not be less with the 2015 model. Strengthening the niche market of such a large population is shaping up as exit. 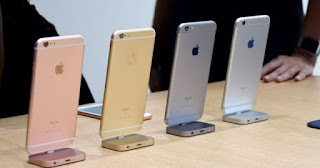 The iPhone 6s was presented on September 9 of that year and came to follow the path marked by the iPhone 6, with two similar models with different sizes and available in colors silver, gold, space gray and rose gold . It was in 2016 the best selling smartphone in the world, which is to endorse the strength of its construction and operation, managed to overcome the blessing , although it was a continuation design.